The Nile is the longest river in the world (6671 km. Fed by the eternal snows of the Ruwenzori mountains, the legendary Nile springs south of the Equator, in Burundi, central Africa, and flows through Lake Victoria, the world’s second largest freshwater lake. It empties into Lake Kyoga and thunders down the Murchison Falls into Lake Mobutu. It then saunters through milliards of runnels of the Sudd, one of the world’s biggest swamps, where it loses through evapotranspiration about 70 per cent of the approximately 28 billion m3 of water it had when it came out of Lake Mobutu. The Nile then enters the stony desert before plunging down a dozen basaltic cataracts. At Khartoum, the capital of Sudan, the lethargic White Nile is rejuvenated, mainly during the rainy season, by the turbulent Blue Nile, which descends from the lofty Ethiopian highlands and constitutes about 86 per cent of the flow into Lake Nasser. Finally, the Nile pours into the Mediterranean Sea through a huge delta after a journey which covers half the African continent and thousands of years of history of human civilization. From time immemorial, it was known that the Nile waters increased in a mysterious way during the hottest season of the year, bringing not only fertility, but also disaster and famine. The ancient Egyptians believed that the River gods sent the floods. Although the Greek historian, Hirodotus, recorded that “the waters come from melted snow”, he had great difficulty in proving it, because “the winds that come from that quarter are hot”, and “the region has no rain and therefore no ice”, He also argued that “the people there are black because of the great heat, and the hawks and swallows stay there the whole year .., and that would be impossible if any snow fell in the lands the Nile flows through, and from which it rises”, Ptolemy, astronomer, mathematician and geographer of the second century AD drew a map showing the Nile rising from two lakes surrounded by the snow-covered “Mountains of the Moon”, As late as the 18th century, his map had not been improved upon. 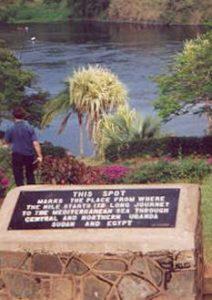 The source of the Nile was an enigma which captured the imagination of generations ever since ancient times. “There is nothing I would more like to know than the origins of the river that have remained hidden for so many centuries, and its unidentified springs”, sighed Julius Caesar. At the end of the last century, it was shown that, in what is now the borderland between Uganda, Zaire and Rwanda, there is a mountain range whose local name, Ruwenzori, means “Rain Giver”. “Mysterious” “luxuriant” “fantastic’ and “fabulous” are all words likely to occur to anyone trying to describe the headwaters of the White Nile. The rain which falls every day is retained by the large leaves of the lobelias and carpets of moss many centimetres thick. The perennially green and wet region which is the source of the Nile can be compared to a huge, endlessly oozing sponge. Although the puny tributary farthest away from the mouth of the Nile is the Luvironza in Burundi, the whole area between lake Victoria and the Ruwenzori Range is considered to be the headwaters region of the Nile. Life-giving water is not the only gift of the Nile. The mud which is brought down by the floodwaters of the Blue Nile from the Ethiopian highlands, is an invaluable fertilizer. Egyptian houses are also built of it, both the rectangular homes of the living and the round houses of the dead. Monuments such as the pyramids were a product of the economic wealth generated by the water: it enabled people to turn the desert in the Nile valley into lush green fields, thereby creating the world’s longest oasis. The Nile flows calmly through the desert, bordered by strips of green date palms. It provides drinking and domestic water, irrigates the fields, supports cattle and provides jobs for men and for camels, which transport, for example, the sugar-cane and cotton which flourish in Egypt’s hot climate and form two of its chief agricultural products. In the times of the Pharaohs, the power of the high priests depended on their being able to prophesy whether the coming season would bring floods or drought. They did this by sending emissaries into Ethiopia to observe the intensity of the summer rains. The consequences of a forecast error were severe. Nowadays, while flood forecasters are not liable to the same penalties, the accuracy and reliability of their forecasts are no less important. Between 1990 and 1993, with technical and financial assistance from the USA, Egypt established a Nile Forecast Centre equipped with a water-balance model using satellite precipitation estimates over the Blue Nile catchment. The aim is to predict the inflow to lake Nasser-a prediction that, it is hoped, is much better than those made during the times of the Pharaohs! In the last forty years, governments, officials, scientists and journalists have highlighted water deficiencies of economically strategic significance and have raised the level of basin-wide hydroparanoia, a serious de-stabilising element in the affairs of the Nilotic countries. This paranoia seems to have peaked after the completion of the Aswan High Dam in 1970 when the idea of selling water to Israel was promoted because Egypt thought it had a surplus of water supply. When the Upper Nile countries could not finance import of petroleum a couple of years later, they pounced on the same idea and claimed that downstream countries must buy water from them. Soon after, not only were water demands growing due to population increase and economic growth particularly in Egypt and Ethiopia, but available water supplies appeared to be decreasing. Although the hydroparanoia has been expressed in terms of “war over water”, the idea of war is far fetched today. The need for incurring this expenditure arises not from the fact that Ethiopian Highlands are still inaccessible, but from the fact that for political reasons Ethiopia has refused to divulge to any body information on rainfall, river flows or any other related elements. Not disregarding the importance of the concern expressed since the Bronze Age and in Mameluke Egypt (15th century AD), the Egyptian needs were first attended to in the late nineteenth century. The British drew up in 1929 the Nile Waters Agreement which imposed what proved to be severe constraints on their Upper Nile dependencies in East Africa not to use Nile tributary waters. The watershed of the White Nile embraces the eight riparian States of Burundi, Ethiopia, Kenya, Rwanda, Sudan, the United Republic of Tanzania, Uganda and Zaire. The Blue Nile drains the two riparian states of Ethiopia and Sudan. The emergence of Eritrea as the tenth riparian State of the Nile (the ninth being Egypt) gives another dimension to the sharing of the Nile waters, since River Atbara has its headwaters there and flows through Sudan into the Nile before it proceeds into Egypt. Sharing the water resources of the Nile represents, perhaps, the greatest development challenge faced by the Nile countries. An enormous amount of water is lost in the Sudd swamps, and development of water resources in the Upper Nile countries will not significantly constrain the supply of water to downstream countries. Moreover, the nature of the terrain in these countries does not permit large-scale use of the Nile waters. The normal flow of water (14 per cent) can, therefore, be easily maintained. In fact, if the resource is wisely developed, the yield can be augmented and equitably distributed. 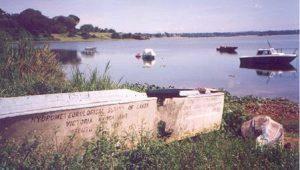 In Kenya, for example, the draining of the Yala Swamps has resulted in reduced evaporation and, therefore, increased inflow into Lake Victoria. On the other hand, approximately 86 per cent of the annual river flow into Lake Nasser comes from Ethiopia; any large-scale extraction, storage and use of water in Ethiopia can be expected to have a significant implication for Sudan and Egypt (Whittington and McClelland, 1992). If Ethiopia is to make economic progress and sustain its rapidly increasing population in the future, it is imperative to develop its water resources. The major “problemshed” is, therefore, the Blue Nile. It is projected that, before the year 2000, Ethiopia will have more people to feed, clothe and shelter than Egypt (UNDP, 1994). Population pressure on land and other natural resources, however, will be much greater in Egypt than in Ethiopia or Sudan, since Egypt has only 2 million hectares of arable land compared with Ethiopia (59.4 million ha) and Sudan (69 million ha) (see table below). Moreover, internal, yearly renewable water resources are non-existent in Egypt, whereas, in Ethiopia and Sudan these represent 10.9 thousand m3 and 1.2 thousand m3, respectively (UNDP, 1994). Food security is a serious concern. Egypt’s heavy dependence on imported food is fast approaching 50 per cent of the amount of food available in the country. The expansion of irrigated land is limited in so far as much land is arable and “widening” the long oasis would be beyond the country’s financial means. The feeling of food insecurity runs even deeper in Ethiopia and Sudan. Although scope for development in these countries is enormous, their ability to finance investment in water and irrigation is highly constrained. Development of water resources in the Nile Basin in the past led to over-designed water-storage schemes, where evaporation alone, in this dry and torrid climate, consumes almost 12 per cent of the 84 billion m3 which flows into Lake Nasser at Aswan every year. . It is the hydroparanoia and not insufficient understanding of the Nile that appears to have led to the construction of high dams with inefficient management options. Schemes have also been mismanaged: over-year storage in the four major reservoirs being negligible, the level of water in them is maintained at the highest possible level, thus exposing the maximum surface area of water to the elements. Upstream riparian countries have, or are developing plans to irrigate their land. Theoretically, for example, a fully developed Ethiopia might, alone, utilize up to 40 billion m3 of water, i.e. almost half the annual flow at Aswan. On the other hand, if water were stored at higher altitude locations in Ethiopia and managed according to a basin-wide, cooperative water-sharing agreement, there is a strong possibility that many water shortage problems of the riparian countries might be resolved. Requirements to meet national development aspirations have been tabled in a number of fora in recent years, in particular the Nile 2002 Conferences, the second of which was held in Khartoum, Sudan, from 29 January to 1 February 1994. There is sufficient confluence of political and legal views that it will be in their interest to come to an agreement on the equitable sharing of Nile water, based on generally accepted, international principles. The perennial hydroparanoia has been diagnosed In order to promote synergism, avoid conflicts and duplication of efforts and attract investment, it will be necessary to coordinate ecologically-based development plans, projects, research and training (Ethiopia, 1994). This is a formidable technical and engineering challenge. Volumes of data and information will have to be collected, sifted and analysed. One way of promoting effective inter-country collaboration is through the cooperative study, design, construction and operation of water resources development projects in the basin, which will either augment or maintain water yield and contribute to the well-being of its inhabitants. Co-operative efforts can commence with essential but low cost activities and services, such as hydrological forecasting, required for operation and management of the basin-wide water system, in particular for flood control, regulation of flows, and navigation. Under the auspices of WMO, national and regional agencies responsible for monitoring weather and water have collaborated for many decades, e.g. through the exchange of hydrometeorological data. Implementing hydraulic and irrigation schemes requires major investments, The setting-up of an autonomous but dynamic Nile Basin Organization will be a clear expression of the political will of the Governments concerned. It will not only attract external technical assistance and investment but also provide the needed bedrock of cooperation. The challenge is to utilize resources in an optimal manner in order to improve the life of all the inhabitants of the Nile Basin. ALLAN, J. A., 1994: Policy Issues in Basin-Wide Integrated Rivers Development. The Nile 2002 Conference, Khartoum, 1994. ETHIOPIA, 1994: Country Paper-Framework for Cooperation between the Nile River Co-basin States. The Nile 2002 Conference, Khartoum, 1994. UNDP, 1994: Human Development Report 1994, UNDP and Oxford University Press, 1994.